Zac Lewis Paingitngs have a very distinct style as the artist is very much inspired by nature and celestial vistas. She is also known to express her feelings through vivid and striking art so we wanted to capture this with the layout of the website. This website is bright, colourful and attractive with a stylish layout. It is also mobile/tablet responsive. 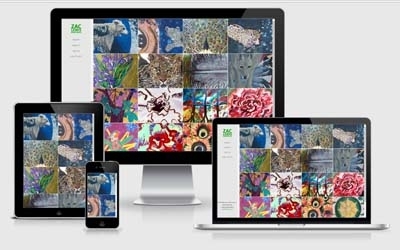 We even hooked Zac's website up to PayPal so that she could sell paintings via her website, an easy ecommerce solution.